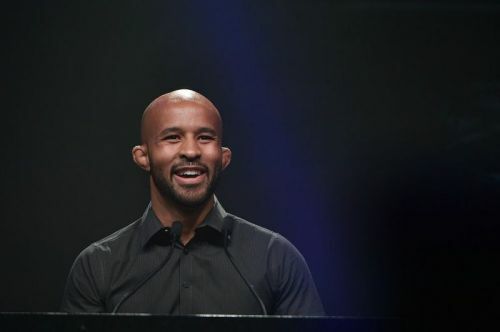 ONE Championship flyweight Demetrious “Mighty Mouse” Johnson has been a professional mixed martial artist for over a decade and has conquered the North American scene where he became a 12-time Flyweight World Champion. The 32-year-old is thankful for the multiple opportunities his mixed martial arts career has given him, most especially the part where he can provide for the people who means the world to him. “Martial Arts taught me hard work pays off,” Johnson said. “I’ve been training since I was 18 years old in martial arts and it has been able to give me a life that I could have never imagined. I was able to travel Asia, I was able to give my wife and kids a life that I did not have and to put my kids to college. That means the most to me. For Johnson, family is everything, and the 32-year-old veteran says that they are the reason why he works so hard in his career. Johnson met his wife in the restaurant where they used to work and eventually, they went into a relationship and got married. Now they have been blessed with three kids whom he can not live without. “I met my wife, Destiny Johnson, at Red Lobster. She was a server while I worked as a cook and after giving her my number, our story took off from there,” Johnson said. Over the span of his career, Johnson has faced many great challenges. But he knew that his mixed martial arts career would serve as an avenue to give his family the life he never had growing up, which is why Johnson keeps on trudging forward. “The only reason why I keep going is my family and obviously the competition to prove that I’m the best in the world but it’s just a fight, just to prove who is better,” Johnson said. “Mighty Mouse” is set to take part in the quarter-finals of the ONE Flyweight World Grand Prix against Yuya “Little Piranha” Wakamatsu in ONE: A NEW ERA on 31 March. His promotional debut will be a part of the heavily-stacked card, ONE Championship’s first live event to be held in Tokyo, Japan. Johnson vows to always be at his best in every performance and we have his family to thank for that. “For me I just want to go out there and compete, put on great performances and take care of my family,” Johnson concluded.